Shea & sugar body polish is the perfect and unrivaled source for fabulously soft skin and glistening radiance after just one use. Repeated use contributes to the total health and beauty of the skin. Wild crafted shea butter and real sugar crystals, saturated with healing oils, vitamins and antioxidants gently exfoliate and bestow restorative treatment and texture. Fragranced with our beautiful journey of the senses collection our seriously sweet formulas transform the skin and transport the senses. 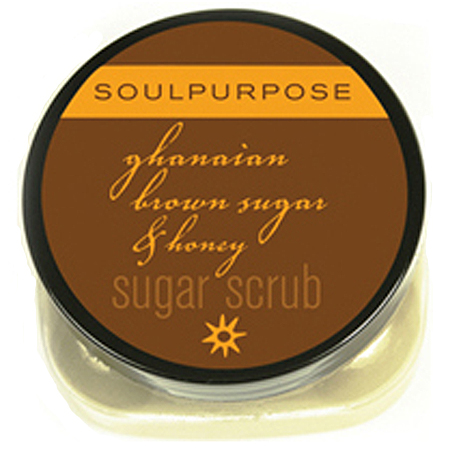 Directions: massage onto damp skin paying special attention to rough dry areas like feet, elbows and knees. Rinse with warm water and feel the magic of beautiful soft skin. Be careful after using this product and towel dry feet well to avoid slipping on wet surfaces. Ingredients: wildcrafted butyrospermum parkii (shea butter), carthamus tinctorius (safflower oil), canola oil, prunus amygdalus dulcis (sweet almond oil), prunus armeniaca (apricot kernel oil), sugar, jojoba beads, euterpe oleracea fruit extract (acai), organic mahonia aquifolium (oregon grape), red wine polyphenols, organic camellia sinensis (green tea), triticum vulgare (vegan vitamin d), cucurbita pepo (pumpkin seed oil), morinda citrifolia (noni), fda fragrance.